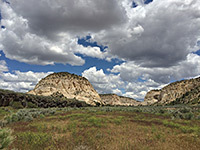 This is a paved road that branches north at the village of Crescent Butte, and follows a shallow canyon with scattered farm houses nestled beneath picturesque eroded sandstone walls. 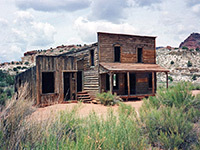 There is also an old western movie set, no longer used but quite well-preserved. The canyon becomes quite scenic after 8 miles as it climbs through the White Cliffs, one of the layers of the Grand Staircase - the rocks are steep and eroded into smooth curved formations, topped by contrasting green vegetation. Soon after, the surface becomes gravel, and an extensive network of tracks criss-crosses the rather featureless, scrub- and fir-covered land of the Skutumpah Terrace, towards the foothills of the Paunsaugunt Plateau, near Bryce Canyon National Park. 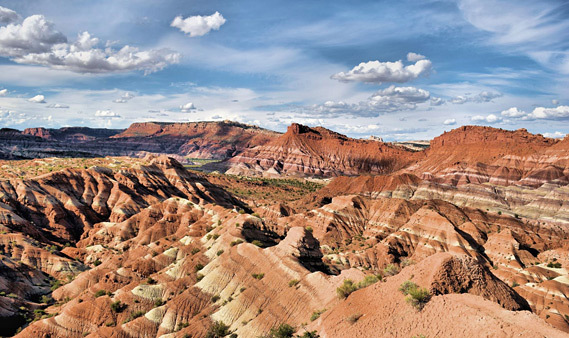 The main route is the Skutumpah Road, which ends at the Paria River Valley where it meets the Cottonwood Canyon Road; it passes several canyons of interest including Lick Wash, Willis Creek and Bull Valley Gorge. This short track descends from the junction with US 89 (milepost 31) into a valley with the remains of the Pahreah ghost town plus the site of a 1930's movie set, both surrounded by amazingly colorful rocks. The road is 6 miles long, and becomes rather steep and twisting near the end, as it crosses the undulating banded hills that cover this area. 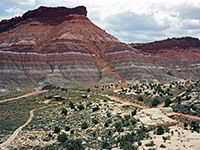 The cliffs at either side are equally layered and multi-colored, with alternating red, white, purple and grayish-blue strata, part of the Petrified Forest Member of the Chinle Formation. There is a large parking area to accommodate the occasional tour buses that used to visit the area; the track continues another mile but deteriorates as it crosses a dry wash a couple of times, passes the old Paria Cemetery which has about 20 graves, their inscriptions faded and illegible, and enters the wide valley of the Paria River. The original Pahreah townsite is located just across the river but very little remains today - just a few stone foundations and remains of wooden fences. The settlement was established in 1869 but abandoned 40 years later because of frequent floods of the river, which flows along a wide valley that is often completely dry in summer but covered in places by an extensive plain of white salt crystals, left from evaporation of the last of the spring flash floods. There are many possible hikes starting from this area, including the route to Starlight Canyon. 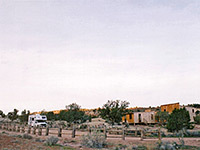 The few scattered wooden buildings of the movie set were situated just beyond the parking area, and featured in many films including some scenes of The Outlaw Josey Wales. They had quite an authentic appearance due to many years of ageing in the desert sun, until in 1999 they were deemed too unstable and all were dismantled, the timbers being saved for future restoration projects elsewhere. In 2000 two replicas of the largest buildings were erected in their place but these were burned down in August 2006. 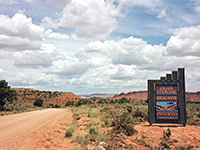 Cottonwood Canyon Road is a long cross country route that leaves US 89 near milepost 18, close to the Paria River ranger station - full description. This is an even longer road (78 miles) that at first crosses a lunar landscape of bare mud hills around the northwest shore of Lake Powell, then turns north, heading across the Kaiparowits Plateau towards Escalante. 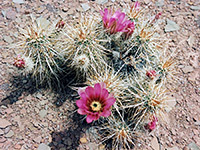 For a description of the southern section, see the Lake Powell guide. 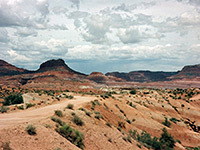 Another US 89 side road (House Rock Valley Road) branches south near milepost 26, passing close to the remarkable Buckskin Gulch slot canyon and the Coyote Buttes region, in land which is part of the Vermilion Cliffs National Monument.